Failure to reach a clinical diagnosis of rapidly progressive renal disease in patients with small kidneys is a common problem in medicine. Renal biopsy is normally not done in such cases due to widespread misconception of its limited diagnostic value attributed to widespread sclerosed glomeruli and/or fibrosed interstitial tissue., Hence, we elected to prospectively investigate the role of biopsying such kidneys, in patients with unexplained rapid progression of kidney disease, in an attempt to assess its value in health-care delivery and future research. Between January 1, 2012, and December 30, 2015, a kidney biopsy was considered in all adult patients who presented with unexplained rapidly progressive renal failure despite their relatively small-sized kidneys (<9 cm). Patients with a definite cause of renal deterioration such as pre- or post-renal etiology, acute tubular necrosis, acute papillary necrosis, vascular disease, positive serology for autoimmune diseases, or drug side effects were excluded from the study. Pregnant women and children were also excluded from the study. Moreover, patients with an unstable cardiovascular state, morbid obesity, sepsis, bleeding diathesis, and those with bilateral kidney size <6 cm were also excluded from the study. Moreover, Doppler ultrasound was used to exclude unilateral or bilateral renovascular/ischemic nephropathy and deep venous thrombosis. Patients were labeled as having unequal kidneys if the difference between them was >1.5 cm. The procedure was performed by an interventional radiologist using a biopsy gun technique and under ultrasound guidance. The study was approved by the Health Science Center Ethical Committee of Kuwait University and Ministry of Health (Re: VDR/EC/2509). The procedure was done in prone position under local anesthesia, under ultrasound guidance using 18-gauge and 10 cm long biopsy gun resulting in an 18-mm sample. 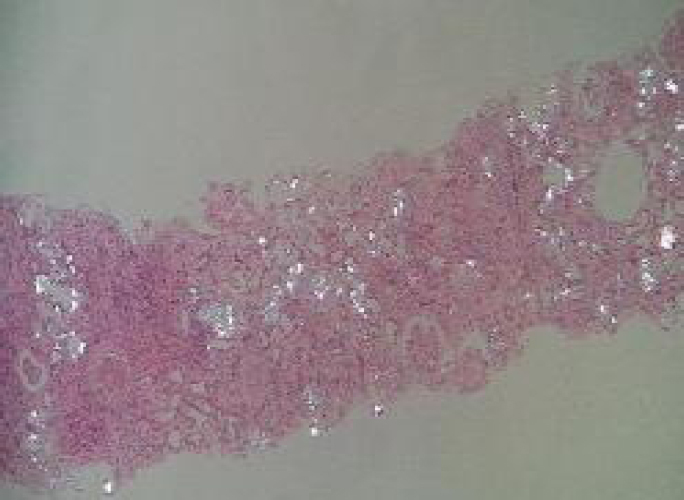 A histo-pathologist examined the harvested tissue for adequacy. Subsequently, the patients were kept flat on their back for 6 h and then just resting in bed for 18 h. They were discharged the next day with instruction to avoid physical activity for one more day. Biopsy tissue was kept in formalin for routine histochemical stains and immunoperoxidase. A minimum of 8 glomeruli was considered adequate for diagnosing glomerular disease. During the study period, a total of 36 patients fulfilled the criteria mentioned above and hence were included in the analysis. Seven cases had diffuse glomerulosclerosis and hence diagnosis was uncertain. In the remaining 29 patients, the diagnosis was established without difficulty using the standard techniques. 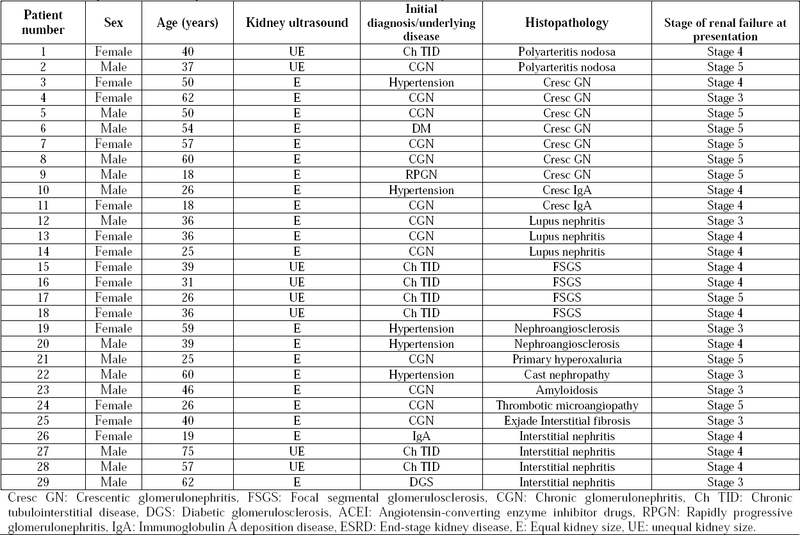 The demographical data, clinical presentation, the relative size of both kidneys, and histopathological diagnosis of those patients are summarized in [Table 1]. Table 1: Clinical presentation of the patients with acute renal failure and small kidneys. The two patients with polyarteritis nodosa were adults and had unequal kidney size due to multiple renal scars which were not limited to their upper poles. Vasculitis was evident and was confirmed by disruption of internal elastic lamina in Shikata stain [Figure 1]. One patient had proteinuria >2 g/day simulating chronic glomerulopathy while the other mimicked chronic tubulo-interstitial disease. They received high-dose steroid and monthly intravenous cyclophosphamide for three months followed by prednisone and cellcept for a total of two years. 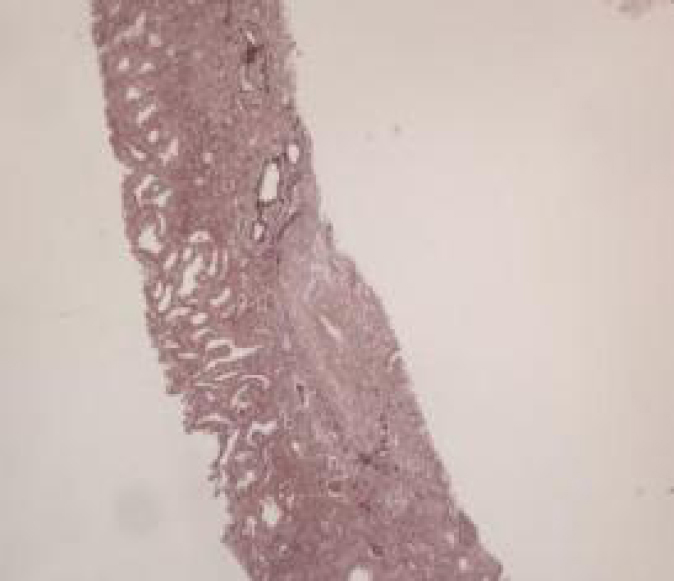 Figure 1: A blood vessel showing segmental loss of internal elastic lamina with wall fibrosis indicating healed vasculitis (Shikata, ×100). Nine patients had crescentic glomerulonephritis [Figure 2]. Immunoperoxidase stains showed that two were due to immunoglobulin A deposition disease (nephropathy). They were treated by the same immunosuppressive protocol for those with polyarteritis nodosa (see previous paragraph). Figure 2: Two glomeruli showing fibrous crescent in one and cellular in the second (H and E, ×200). The three patients with lupus nephritis were young adults, of whom one was a male. All had negative ANA and anti-ds-DNA, and levels of serum complement 3 and 4 were normal. 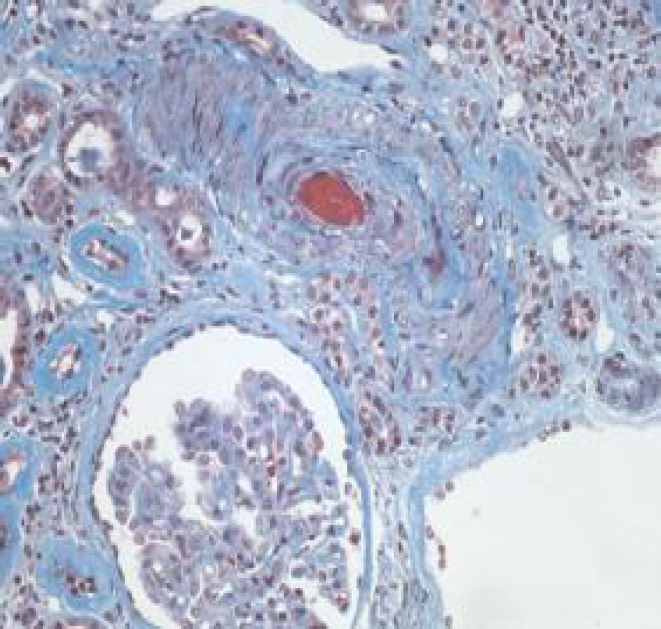 Their kidney biopsy showed diffuse proliferative glomerulonephritis with full-house immune deposition [Figure 3]. They were treated with similar immunosuppressive therapy to those with polyarteritis nodosa with no positive result. 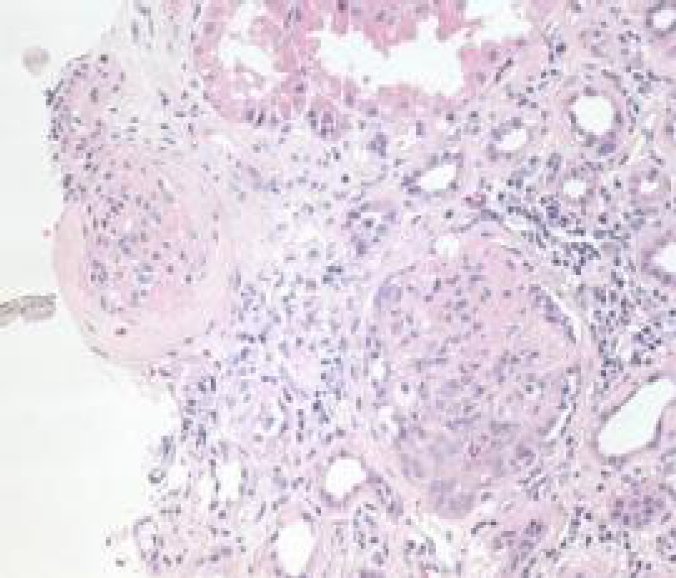 Figure 3: Proliferative glomerulonephritis with crescent formation and interstitial infiltrate with fibrosis (H and E, ×200). Four patients with secondary form of focal segmental glomerulosclerosis (FSGS) had rapid progression of their chronic renal disease associated with hypertension, edema, and a decrease in serum albumin, hematuria, and progressive proteinuria. Previous urine analysis in these patients did not show significant proteinuria or hematuria and their kidneys were small and unequal with evident scars at their upper poles. On histology, most of the glomeruli were sclerosed yet few showed a focal and segmental pattern with negative deposition of IgM on immunohistochemical testing. In those patients, periglomerular fibrosis was evident with chronic inflammatory infiltrate indicative of chronic interstitial disease [Figure 4]. These patients were managed conservatively. 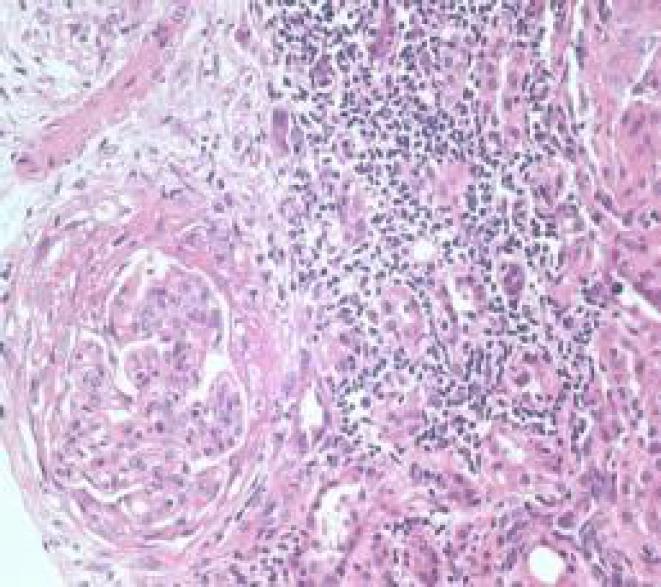 Figure 4: Focal segmental glomerulosclerosis complicating atrophic pyelonephritis: glomerulus with segmental sclerosis and periglomerular fibrosis. The interstitium shows infiltrate of plasma cells and lymphocytes associated with focal fibrosis (Trichrome, ×200). Two patients with a history of hypertension had features of malignant form in one [Figure 5] and chronic hypertension with FSGS in the second [Figure 6]. In the latter, immunohistochemical stains were negative for immune deposits. They were managed conservatively. Figure 5: Malignant hypertension with fibrinoid necrosis of blood vessel (H and E, ×400). 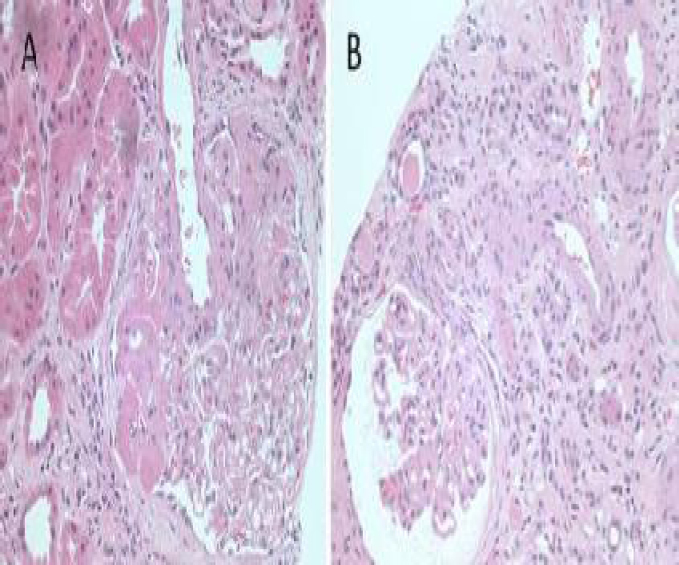 Figure 6: Segmental glomerulosclerosis (a) and ischemic glomeruli in a linear pattern (b) indicating nephroangiosclerosis (H and E, ×400 and ×200). One patient had primary oxaluria [Figure 7] and had to undergo combined liver and kidney transplantation. One patient had extensive cast nephropathy which was monoclonal [Figure 8]. He improved to stage 3 after six-month treatment with prednisone and melphalan and remained well for 32 months. One patient had amyloidosis on histology [Figure 9] due to familial Mediterranean fever. 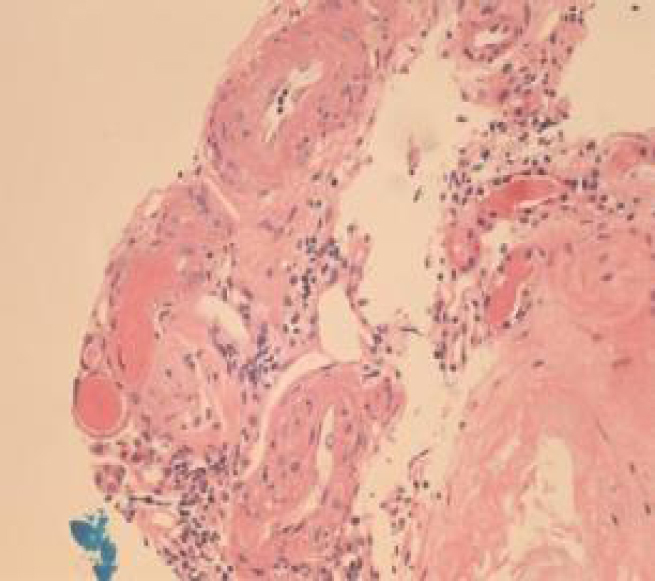 One patient had extensive thrombotic microangiopathy on biopsy [Figure 10]. One patient with thalassemia major had extensive interstitial fibrosis with negative iron stains in the kidney interstitium excluding iron as the culprit [Figure 11]. Four patients had unexplained interstitial nephritis [Figure 12]. All improved with short courses of prednisone. Figure 7: Primary hyperoxaluria: evident extensive deposition of the birefringent calcium oxalate crystals in the tubules and interstitium seen under polarized light microscopy (H and E, ×100). 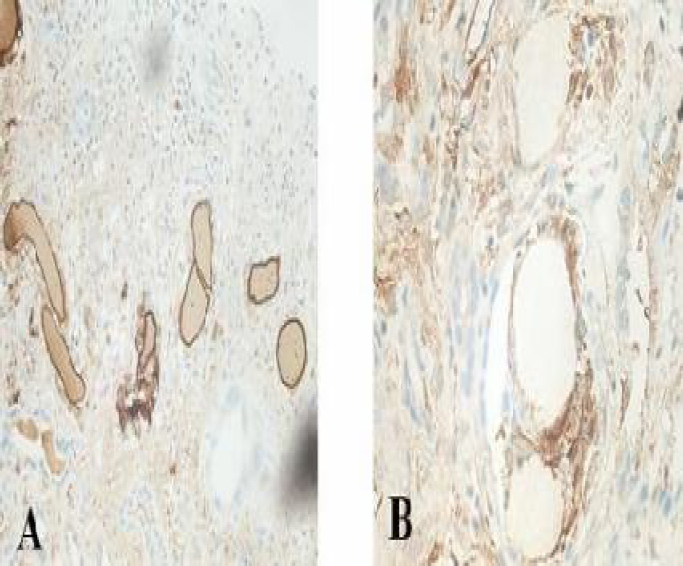 Figure 8: Immunoperoxidase stain of the tubular casts showing lack of stain for lambda (a) and positive stain for kappa (b) indicating free light chain cast. Figure 9: Secondary amyloidosis: polarized light microscopy showing apple-green dichroism of deposits in the mesangium and interstitium (Congo Red, ×400). 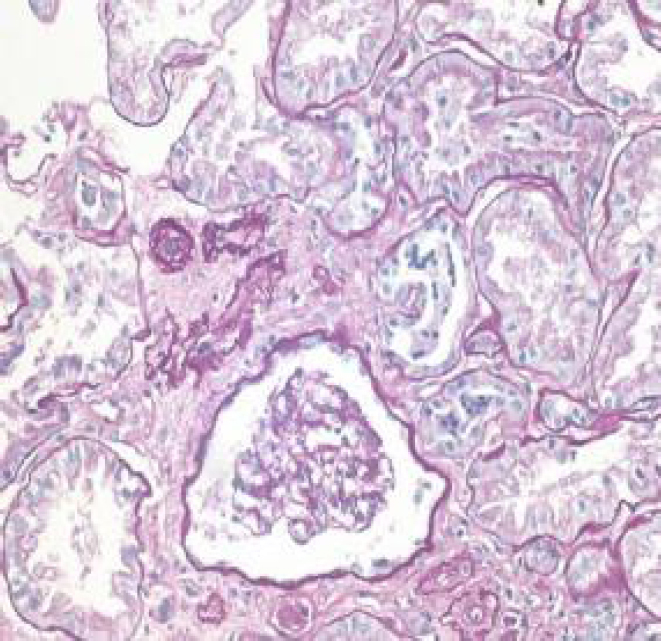 Figure 10: Thrombotic microangiopathy: a preserved glomerulus near a blood vessel with thickened intema surrounding a recent thrombus (Trichrome, ×100). 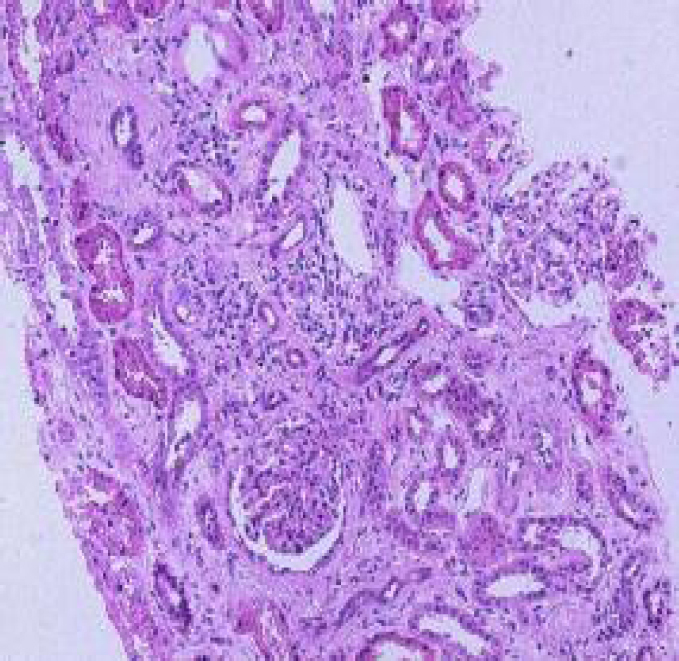 Figure 11: Photomicrograph showing normal glomeruli surrounded by interstitial fibrosis (PAC, ×400). 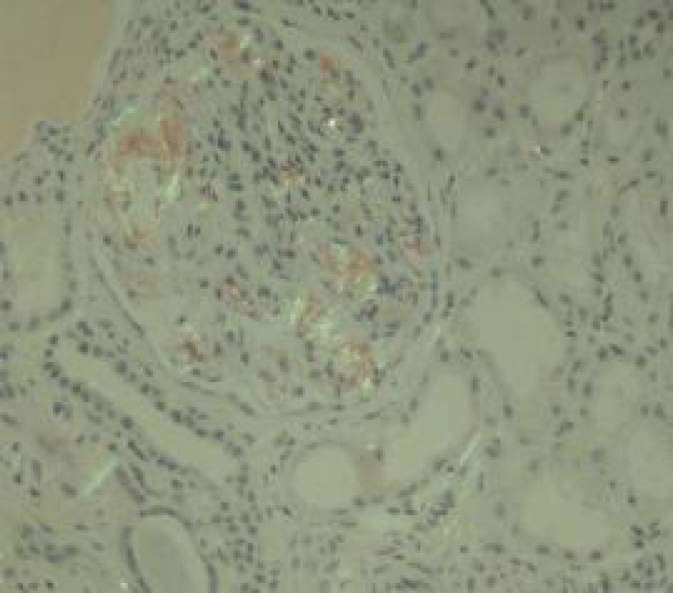 Figure 12: Showing interstitial nephritis with diffuse interstitial infiltrate of lymphocytes and plasma cells (H and E, ×100). Unequal kidney size was a feature of patients with polyarteritis nodosa and those with underlying chronic reflux nephropathy. Details of the renal function at the end of the study and the duration of improvement are summarized in [Table 2]. Four patients (number 9, 17, 21, and 24) presented with unrecoverable kidney failure and had required maintenance hemodialysis. Four more patients (number 15, 16, 18, and 19) developed end-stage renal disease (ESRD) despite specific therapy after conservative treatment for 3, 12, 8, and 16 months of follow-up. All patients with the secondary form of FSGS were at Stage >4 at presentation and reached ESRD on follow-up. Of the remaining 18 patients, 15 remained with adequate levels of kidney function (Stage 3) by the end of the study and three were kept off dialysis (Stage 4) for a minimum of three to 16 months. Better control of hypertension with nonangiotensin-converting enzyme inhibitor/angiotensin receptor blocker drugs and low protein diet prolonged their kidney survival. Table 2: Outcome of patients with acute renal failure and small kidneys after specific treatment. All patients had adequate kidney tissue for diagnosis. Almost all patients had transient hematuria which cleared without the need for transfusion. Only two patients had a significant perinephric hematoma that needed extra days of in-hospital bed rest. There was no injury to other organs or death. In clinical practice, renal biopsy is an important aid in the management of patients with renal disease. Since it provides a histopathological diagnosis of their disease and its stage of activity, it may alter future management in up to 40%–60% of cases., Traditionally, small (<9 cm) and hyperechoic kidneys are considered indicative of chronic irreversible disease and hence biopsy of such kidneys was not considered safe or useful. Our results, contrary to the widespread notion, showed that such procedure was safe and useful. The available tissue contained >5 glomeruli and hence was considered adequate for diagnosis. The diagnosis was established in 29 of the 36 patients (81%) biopsied. Moreover, 18 patients (50%) remained with an adequate level of kidney function (Stage 3) by the end of the study and three more patients were kept off dialysis, at Stage 4, for a minimum of 3–16 months. Favorable outcome was evident in patients with vasculitis, lupus nephritis, nephroangiosclerosis, cast nephropathy, and interstitial nephritis, but not in those with the secondary form of FSGS. Our study confirms the high prevalence of silent and indolent variants of systemic diseases such as vasculitis, lupus nephritis, and interstitial nephritis.,,,, Moreover, renal biopsy is useful in the diagnosis of isolated cases of cast nephropathy, amyloidosis, thrombotic microangiopathy, and primary hyperoxaluria. To improve the yield of biopsy of small kidneys and reduce complication, we suggest that, with a dedicated invasive radiologist allocated for the procedure, an ultrasound-guided technique is used and a dedicated histo-pathologist is available for immediate examination of the harvested tissue for its adequacy to avoid repeated punctures and future need for a second biopsy and that an 18-gauge needle is used to avoid the inherent risk of bleeding associated with larger needles. Alternative approaches include computed tomography (CT)-guided and transjugular techniques as well as direct sampling using the laparoscopy and open biopsy. The latter two are relatively invasive, yet the CT-guided scan can be useful when the kidneys are not well visualized by ultrasound, as with marked obesity. The transjugular approach, though useful in patients with diathesis or small kidneys, is contraindicated in patients with acute renal failure with its inherent risk of contrast nephropathy. As we have indicated, in our pilot study, we excluded children for their need to general anesthesia and pregnant patients to avoid fetal complications. Clinical competence in percutaneous renal biopsy. Health and Public Policy Committee. American College of Physicians. Ann Intern Med 1988;108:301-3. Madaio MP. Renal biopsy. Kidney Int 1990;38:529-43. Richards NT, Darby S, Howie AJ, Adu D, Michael J. 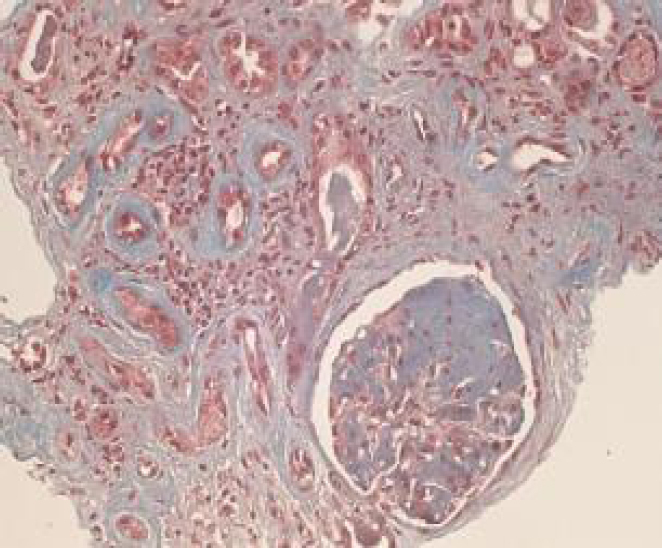 Knowledge of renal histology alters patient management in over 40% of cases. Nephrol Dial Transplant 1994;9:1255-9. Cohen AH, Nast CC, Adler SG, Kopple JD. 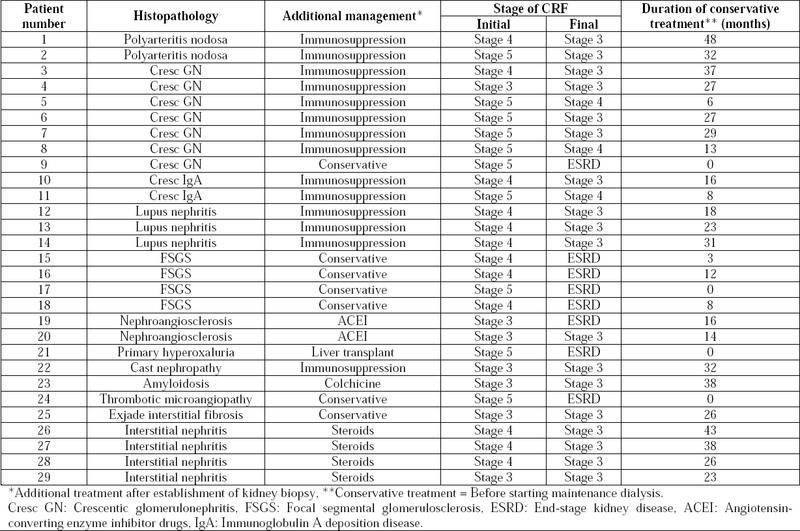 Clinical utility of kidney biopsies in the diagnosis and management of renal disease. Am J Nephrol 1989;9:309-15. Appel GB. Renal biopsy: How effective, what technique, and how safe. J Nephrol 1993;6:4. El-Reshaid W, El-Reshaid K, Kapoor MM, Madda JP. Glomerulopathy in Kuwait: the spectrum over the past 7 years. Ren Fail 2003;25:619-30. Baldwin DS, Neugarten J, Feiner HD, Gluck M, Spinowitz B. The existence of a protracted course in crescentic glomerulonephritis. Kidney Int 1987;31:790-4.
el-Reshaid K, Kapoor MM, el-Reshaid W, Madda JP, Varro J. The spectrum of renal disease associated with microscopic polyangiitis and classic polyarteritis nodosa in Kuwait. Nephrol Dial Transplant 1997;12:1874-82. Pagnoux C, Seror R, Henegar C, et al. Clinical features and outcomes in 348 patients with polyarteritis nodosa: a systematic retrospective study of patients diagnosed between 1963 and 2005 and entered into the French Vasculitis Study Group Database. Arthritis Rheum 2010;62:616-26. Austin HA 3rd, Boumpas DT, Vaughan EM, Balow JE. Predicting renal outcomes in severe lupus nephritis: contributions of clinical and histologic data. Kidney Int 1994;45:544-50.
van der Hoeven SM, van Woerden CS, Groothoff JW. Primary hyperoxaluria type 1, a too often missed diagnosis and potentially treatable cause of end-stage renal disease in adults: results of the Dutch cohort. Nephrol Dial Transplant 2012;27:3855-62. Maya ID, Maddela P, Barker J, Allon M. Percutaneous renal biopsy: comparison of blind and real-time ultrasound-guided technique. Semin Dial 2007;20:355-8. Corapi KM, Chen JL, Balk EM, Gordon CE. Bleeding complications of native kidney biopsy: a systematic review and meta-analysis. Am J Kidney Dis 2012;60:62-73. Korbet SM. Percutaneous renal biopsy. Semin Nephrol 2002;22:254-67. Barrett BJ, Parfrey PS. Clinical practice. Preventing nephropathy induced by contrast medium. N Engl J Med 2006;354:379-86. Day C, Hewins P, Hildebrand S, et al. The role of renal biopsy in women with kidney disease identified in pregnancy. Nephrol Dial Transplant 2008;23:201-6.